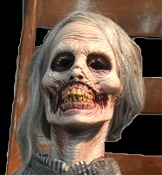 Perfectly preserved, this classic deluxe Psycho inspired animatronic realistic Life Size Mother slowly rocks back and forth as she contemplates your fate. This creepy life-sized animated deluxe sitting Halloween haunted house prop decoration has a foam-filled latex body with metal armature and heavy duty electric motor. She has a grey wig and long dress, with scary hand painted detailing on her face and hands. You supply your own rocking chair! Spooky soundtrack CD is included to use with your own CD player. See our video! Recommended for indoor or covered porch use only. Please note: Outfit may vary. Runs continuously - not motion or sound activated. Solid steel mechanics - not plastic. Built to last! Body is all latex: entire torso, head, full length of arms and legs. A very high quality Halloween haunted house prop. Life Size Animatronic Prop approx 44-inch (110cm) sitting height from floor to top of head. Approx 27-inch (67.5) high from chair seat to top of head. Approx 52-inch (130cm) lying flat. *Note: This item cannot be delivered to P.O. Boxes - Please provide a physical address.